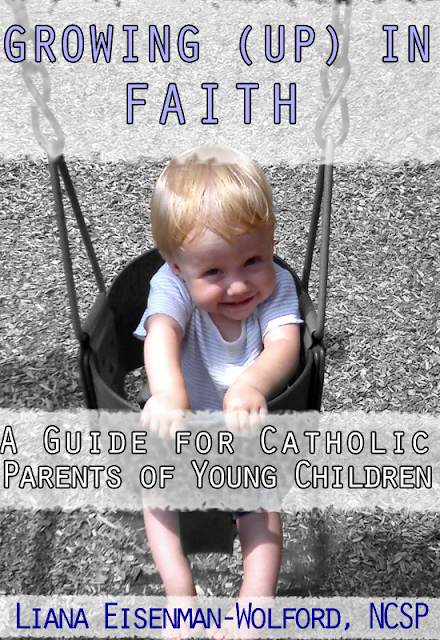 Growing (Up) in Faith - an ebook review | House Unseen. Life Unscripted. These liturgical seasons are also a beautiful way for our children to learn about and gain an appreciation for our faith because they're predictable and exciting...just like kids. From the awesome idea files comes Liana Eisenman-Wolford's book Growing (Up) in Faith: A Guide for Catholic Parents of Young Children, an ebook to help parents in the spiritual formation of their little ones, aged 1 thru 5 years old, organized according to liturgical seasons. So clever! The book begins with Advent, covering liturgical colors, history, and traditions. You'll also find a collection of craft and activity ideas to help your son or daughter really appreciate the season for what it is, and not just as a drawn out pre-gaming for Christmas morning. Each season after that is described in a similar way- Christmas, Ordinary Time I, Lent, Easter, and finally Ordinary Time II. You'll also find bible verses perfect for memorization in Appendix A followed by common Catholic prayers in Appendix B, all appropriate for your sweet sponge (you know, what with the absorbing everything around them and all). This book is really such a handy tool, especially for someone like me who didn't grow up in the Church. I don't have my own family's traditions to draw from nor do I have an innate appreciation (yet!) for how each season ought to "feel" when you're a kid, ya know? Liana to the rescue! So if you're looking for some handy tips on cultivating the spiritual life of your extra youngins and you, like me, are enamored with the glorious liturgical seasons of the Church, check this ebook out. Not only is it helpful and affordable (only $2.99!) but 10% of author royalties are going to support Angel Care, a ministry providing cribs, car seats, and layettes to mothers in need. And while you're at it, follow her blog Working to be Worthy, which she describes as "a life of natural parenting, living green, and Catholic stewardship." Good stuff, right? p.s. Liana gave me a copy of her book to peruse but did not compensate me in any way for this post. I wrote all this out of my own little brain, pinky swear. That is so awesome! I've actually been looking for something like this. I love that I can get it on my Nook and best of all I'm pretty sure I have $3 left on my BN gift card!